I admit this is a bit of an unusual post for a f/l/b blogger... however since moving t0 London I've been completely obsessed with taking photographs of the sunset from my window. This post was actually inspired by a fellow blogger Danielle Eskdale, who's blog post on a year of skies was extremely beautiful! Credit goes to Cloudy for this one! I hope you enjoyed these images, I'm so happy with the quality my Canon EOS 70D produces. Believe it or not, they actually look more beautiful in person. I am so lucky to have the view I do in London. I've heard good things from MeMeMe cosmetics, so when I was approached asking if I wanted to review some of their products, I of course said yes. I first heard about MeMeMe due to their Highlighter which was a benefit dupe. I couldn't get any products locally, so I never actually tried it! - oops. If you're a make up lover like me, MeMeMe will be a brand you've heard about and want to know more about... Here goes! Firstly their packaging has been given a major revamp, which gives the drug store price products, a high end feel. It may sound petty but I love it when a product I've bough feels and looks good as well as doing it job, it makes me love it more. Another thing I would like to add for anyone who takes interest, is that MeMeMe are CRUELTY FREE! Dismissing the name 'face base' this is a pre-make up moisturiser and actually my favourite product of the bunch. I have dry skin and I'm really picky with face moisturisers; understandably. I normally use Olay, Clarins, Elemis, Clinique... So of course when I was given a brand's such as MeMeMe's moisturiser I was skeptical. However this product does exactly what it says. It moisturises your face without being too sticky/tacky so that you cannot apply foundation without it breaking with the moisturiser. The scent is divine which helps, It's a fresh zingy scent that awakens you... as well as your face. If you try one product from MeMeMe, TRY THIS ONE! If you're a frequent reader, watcher, social media fan, then you will know that I am obsessed with lip products - specifically lipsticks. I've found my self lately reaching for more and more drug store products over my high end products, which says something about their quality. This lip product has such a beautiful pigmentation and the actual formulae is good, lets start with that shall we? There is something about the packaging of this product that I just don't like. As you can see on the lid, It gives off that sort of magazine freebie feel which does irritate me as the product itself is good! If you're going to use this product, or any lip crayon, I would 100% say that you need a lip liner that matches as if not it gets messy. I love the fact that this product is a duo set, it's innovative, clever and frankly just handy to shove in your make up bag. This is the first time I have ever used brow gel and If I'm honest with you I wasn't that impressed. I don't know whether it's the product itself, or just the concept of brow gel but it doesn't personally work for me. I do like the fact that the brush for the brow gel is small enough to manoeuvre around your brows. The Highlighter. Oh boy. It's in short, BEAUTIFUL. This pigmentation, colour and shine you get from this highlight is so beautiful people will think you're a unicorn. You may be thinking, Hannah that's a slight exaggeration I can see the photo, but nope. Not even my Canon 70D can show how beautiful that highlighter looks in person. I now 100% understand the past hype on their highlighters. Overall I'm really impressed with MeMeMe. If you're looking for a cruelty free brand, that product's actually work then you need to have a look on the MeMeMe website! Hopefully I've inspired you to do some website shopping, leave a comment saying what product you're most intrigued by! Hi everyone! This was the first 'blogging gals' event that I have attended and I'M NOW LIVING IN LONDON! 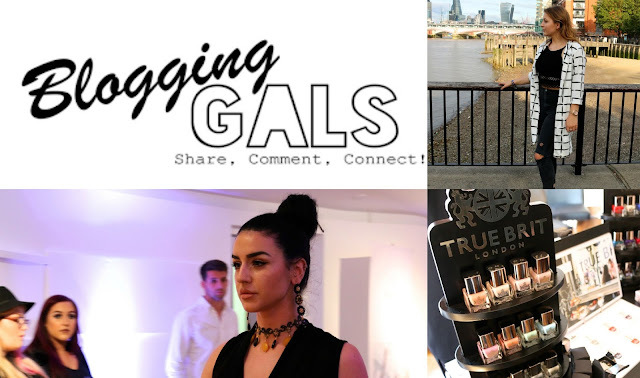 #BloggingGals Is intended to unite bloggers with like minded bloggers as well as giving them the opportunity to work with brands and gain business contacts. I've attended a few blogger events in my year of blogging, meaning I get the way they work now. This event was a bit too crammed and busy for me, I'm not sure if it was because of organisation, or the fact that the gifting lounge had a thin walkway... but it wasn't 100% pleasant. (Disclaimer, I'm not insulting the company, I just personally think it probably wasn't the best of all their events as I've heard good things. To get to this event, was the first time I had been on the tube by myself. I know it may sound ridiculous to some, but it felt like a pivotal moment for me in my moving to London escapade. Getting the tube as a young woman, isn't the easiest thing to do, so changing tubes, discovering which lines i needed and getting myself to south bank was a big deal for me! The theme was black and white. I'm not really one for themes, or black and white... So I probably would have turned up in my bright yellow duster coat and red lippy - can't go wrong! One of my favourite things about blogger events is meeting other bloggers. I've previously met Lauren and the Ax Paris and Mybandage dress events and I adore her. 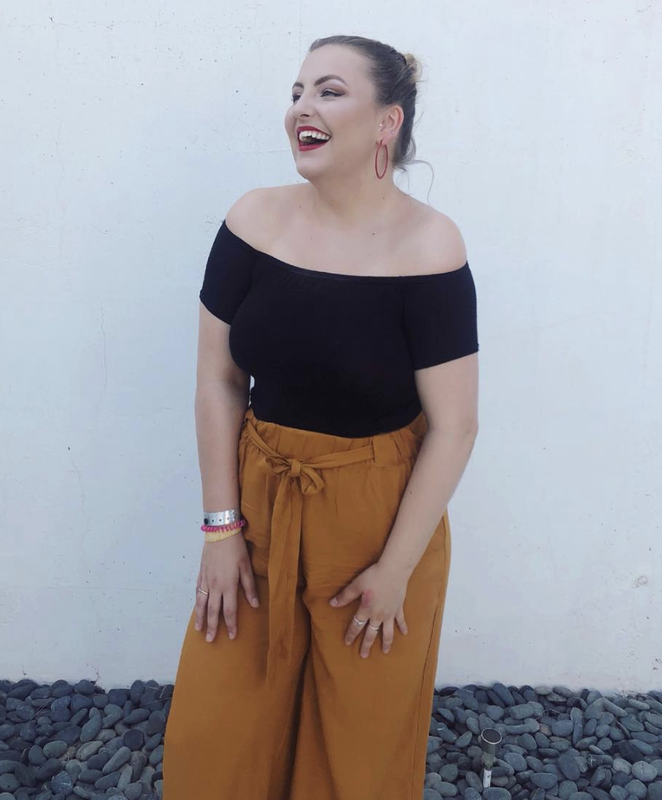 She is absolutely lovely and runs the blog Journey Of A Pr Girl. This was the first time I had met Layla a fellow Norwich girl, she is lovely and so easy to talk to. I definitely recommend both their blogs! Go support my girls. The gifting lounge is sort of like a market set up. It felt very crammed and like bloggers/girls were forcing to get into a space. I guess you could say It was a little claustrophobic. Of course meeting the companies and gaining contacts was wonderful as always, but It just felt a little bit more intense than in necessarily needed to be. True Brit are a company which I discovered and I am obsessed with! Their polishes are so beautifully packaged and give such intense beautiful pigment on the nails. Not only do they have an extensive colour range, the workers are enthusiastic and wonderful. Not 100% sure why Benefit were at this blogging event... Nonetheless it was lovely to talk to the Benefit ladies. This model is fierce and she knows its. I was very grateful of my earrings from Miglio, however they're not my style. I'm sending them to my mum, so that she can enjoy them. They're so beautiful and I know she will look beautiful in them. I am obsessed with this scent! If you ever get the opportunity to give Valmount perfumes a smell, I highly recommend as this scent is so scrumptious. Throughout the whole event I was posting snapchats, so be sure to keep up to date with me on snapchat: hanjanewilliams and in general all of my social media accounts!